Welcome to the Hampton Inn San Antonio-Downtown /River Walk/ hotel. 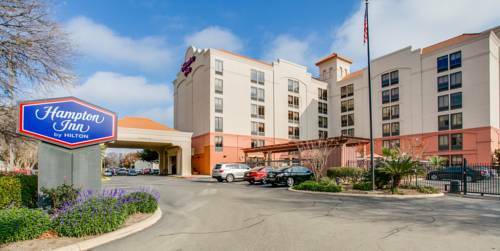 Our beautiful hotel is located in San Antonio Texas just blocks away from the famous San Antonio River Walk/River Center Mall the historic Alamo the San Antonio Convention Center and we are only eight miles from the San Antonio International Airport. The Hampton Inn San Antonio-Downtown hotel features six stories with 169 rooms. Our hotel offers the following complimentary amenities our daily On the House hot breakfast wireless Internet access parking local calls and HBO/CNN/ESPN/FOX cable channels. A coffee maker voicemail hair dryer iron and ironing board are also available in every guestroom. Our Texas hotel also offers connecting rooms cribs rollaway beds valet services an on-site laundry facility outdoor pool fitness center and patio. Area attractions include El Mercado /an authentic Mexican Market/ Hemisphere Park an IMAX Theatre an 18th Century Spanish Colonial Mission and an array of unique shops and historical sites. A variety of great restaurants including Paesano*s Texas Land and Cattle and the Fig Tree are just a short walk from our Hampton Inn hotel. Of course don*t forget the famous San Antonio River Walk just a few blocks from the hotel for great shopping dining and entertainment. We love having you here in Texas at the Hampton Inn San Antonio-Downtown /River Walk/ hotel. All reservations must be guaranteed with a major credit card or adv cash deposit to hotel regardless of time of arrival. All reservations must be cancelled by 11:59pm the night prior to arrival unless deposit required. Policy subject to change. ALL RESERVATIONS MUST BE CANCELLED BY 11:59PM THE NIGHT PRIOR TO ARRIVAL UNLESS DEPOSIT REQUIRED IF THIS RESERVATION HAS BEEN MADE ELECTRONICALLY PLEASE CANCEL IT ELECTRONICALLY TO AVOID CONFUSION AND A NO SHOW BILL. Policy subject to change. A great place to relax along the busy San Antonio Riverwalk with the private patio and swanky Agave Room bar enjoy tasting one of our 80 different tequilas or some of the best Mexican food San Antonio has to offer.